Your opinion matters. Leave your review of Lifting Up Westchester Grace's Kitchen. Description: Grac's Kitchen is the largest soup kitchen in White Plains and is the only soup kitchen where the hungry can regularly get a free meal every Monday through Friday, and on all major holidays throughout the year. Monday through Friday, 10:30 - 11:30 am. Donations of money and food are welcome thank you in advance for your interest and generosity! 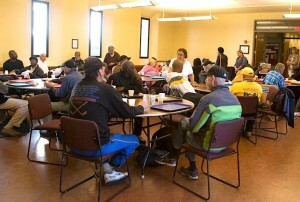 Volunteer assistance is needed in Grace's Kitchen weekdays from 9:00 am to 12:00 pm. Volunteers are needed to help serve holiday meals on Thanksgiving, Christmas and New Year's Day. Do you have items to donate? Contact Lifting Up Westchester Grace's Kitchen at the phone number provided above to see if they can use any items you may have to donate. If you are looking to volunteer for Thanksgiving or any other time, please contact Lifting Up Westchester Grace's Kitchen at the phone number provided above.